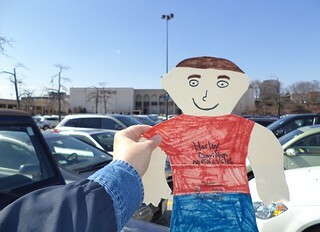 I stumbled across this scanned photo of Flat Stanley while sorting photos on my office computer. 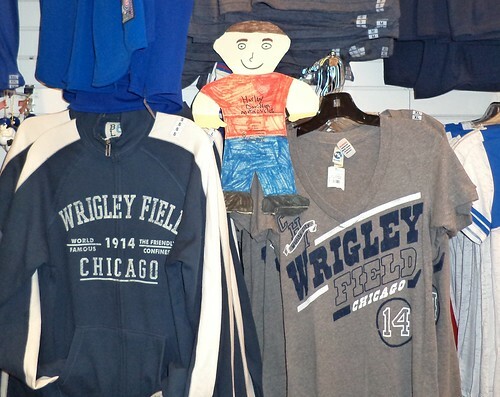 Stanley and I had gone shopping to Woodfield Mall. Meredith collects patches and spoons from various places so, when she asked if she could send me money for those items, I knew right where to go. Of course I refused money. I was happy to do it and I got some great photos of Stanley. Woodfield, north of me, is one of the largest indoor malls in America. For a time, it was the largest in North America, but has been eclipsed by another in Canada. As with any mall, it's seen its share of stores come and go. We used to go here a lot as it had a couple of stores devoted to games and gaming. Those are gone. There used to be a huge Disney store, but that's been scaled down to half its original size. I like the JC Penney that anchors one end and the mall has a Clarks store. Between that store and Penney's, I have access to every style of shoe Clarks makes. 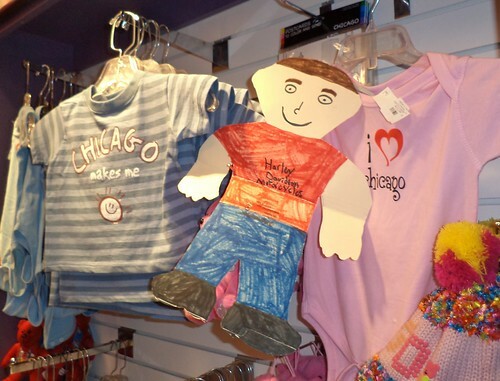 But Stanley and I were looking for one store in particular, Love From Chicago. I found my spoon and patch and a few other items which I knew would be appreciated and Stanley posed with the merchandise. If it has anything to do with Chicago, you'll find it here. As I walked through the mall to the store, I noticed one thing I just had to do with Stanley. This was the weekend before Easter. How could I NOT have Stanley visit with the Easter Bunny? The gals taking the photos giggled. It was hard to know how the guy who was the Easter Bunny felt. I hope he got a kick out of it. Meredith was aghast at the cost for a couple of photos but, come on, it was the Easter Bunny. I got the cheapest package, which was 2 4x6 photos. There was one for Dillon's class and one for Dillon himself. 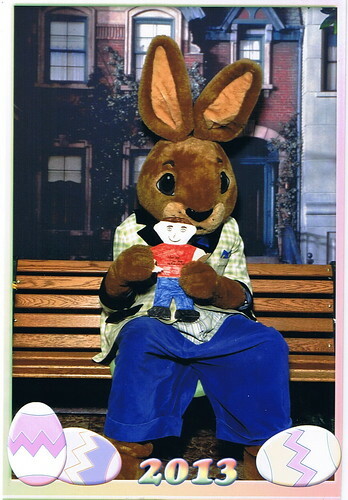 As it turned out, I was the only person entrusted to take Stanley around who had him visit the Easter Bunny. Score one for the lady in Illinois.